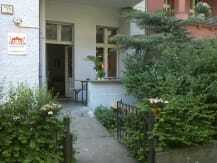 We are situated in the most up and coming vibrant area of Berlin Fiedrichshain/ Kreuzberg. 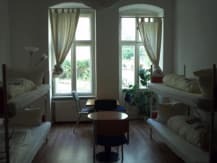 The Backpack Berlin offers affordable accomodation. The reception is open from 8.00 am until midnight. Smoking is outside on the tereace. All day coffee , tea and cereals are for free. No curfew, but the reception is open until midnight! You will receive a doorcode upon check-in. Note: You can check in later if you write us an email! 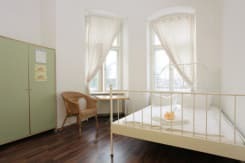 City Tax of Berlin of 5% is not included in the bed price. Train RB18 (Regio) to Ostkreuz is the most direct way and then it is just a 10 minute walk to us. Get out of the station to Sonntagstr. 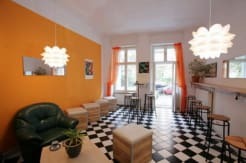 Walk along Sonntagsstraße up to Wühlichstraße and turn left 45 degrees (30 m), turn right and cross the street into our street: We are the building next to the corner store, Knorrpromenade 10! Alternatively, you can take the S9 to Adlershof and then the S8 to Ostkreuz, or the S45 to Baumschulenweg and then the S85 to Pankow. It is recommended to ask people or use Google Maps to find the quickest way. From Hbf: Take the trains heading east (S3, S5, S7, S9) exit at Ostkreuz and follow as written above. If you have lots of luggage exit at Ostbahnhof and take the bus 240 to 'Wismarplatz'. Then head right into the street with the bike shop, go left after 50 m (little Bio shop) and straight right and you are in the Knorrpromenade. Have a good trip! Ask us via email in case you need further help! We are in the hub of hip Berlin with amazing uncountable bars, cafes and restaurants!